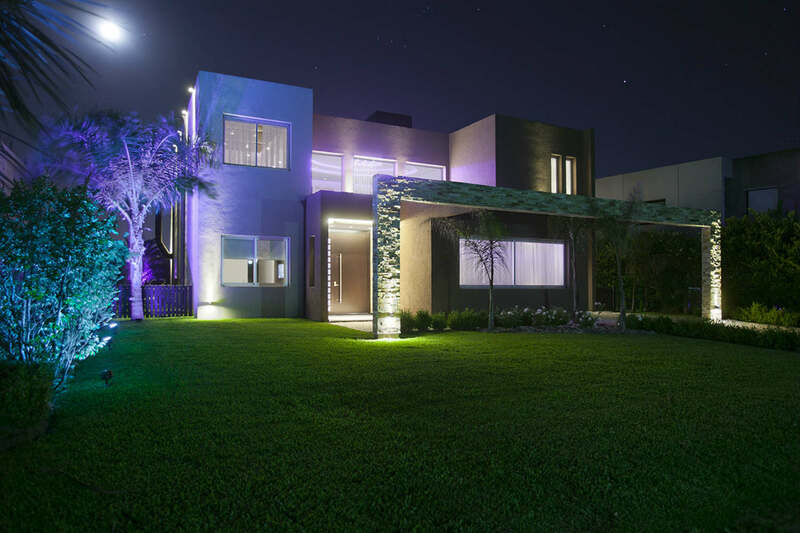 A recently completed luxury home in BA’s upscale Cañuelas suburb, reflects the advantages of engaging a single creative entity to develop the entire unified interior design for a new family home. 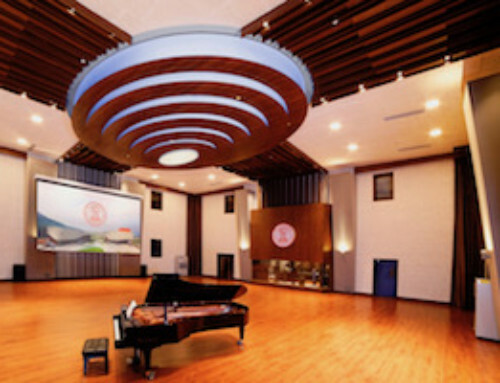 As co-partners in WSDG -Walters-Storyk Design Group, a leading international architectural, acoustics and system design firm, Silvia and Sergio Molho benefit from years of experience in developing high-end professional audio video production studios and home theaters. 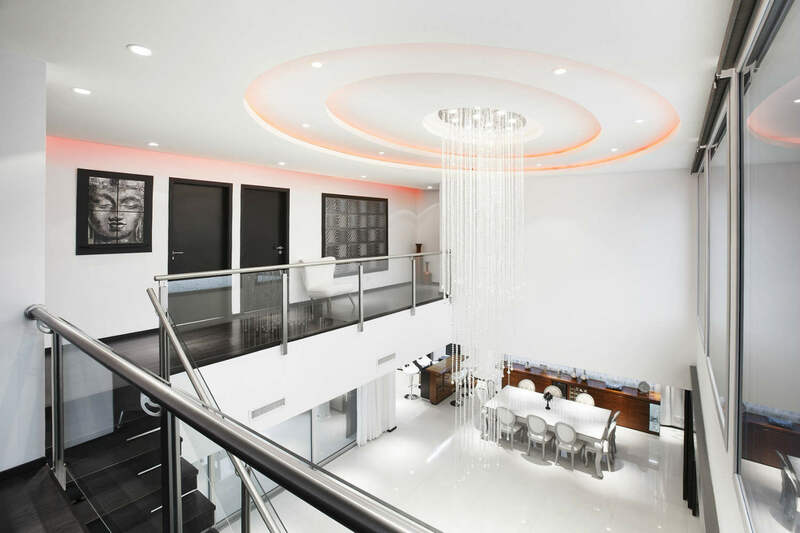 As friends of the client, they had the additional advantage of deep insights into the homeowners’ aesthetic tastes. When construction of the 3000 sq. 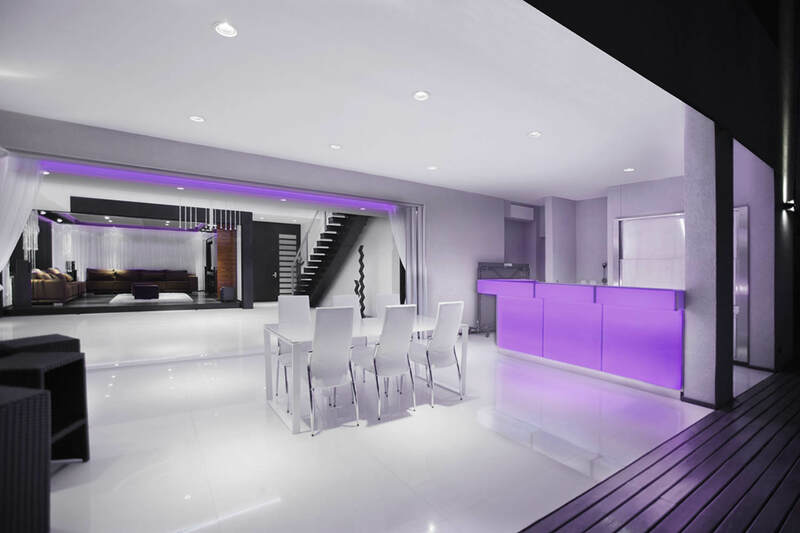 ft. dream home began, Silvia Molho initiated an intensive interior design program to develop a custom furniture and lighting scheme, and an appropriate color palette. 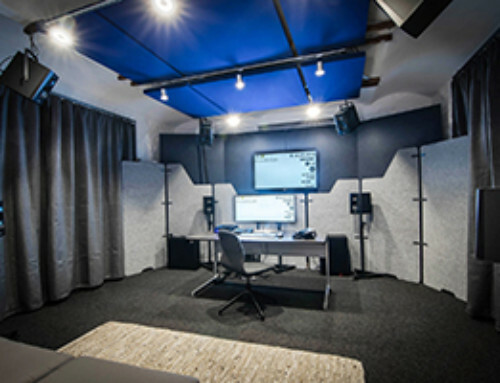 Simultaneously, Sergio Molho, a skilled acoustician and technology guru, focused his efforts on developing an acoustic modeling scheme to insure the optimal combination of Surround Sound and video technology, and, interior acoustics to provide the home theater with the finest viewing/listening experience. Suspended from the center of a triple recessed oval in the double height ceiling above the ‘great room’ entranceway is a singular chandelier. Adorned with fifty-eight individual crystal beaded strands of color programmable LEDs, the iconic fixture provides the template for a series of smaller lighting units, which adorn the dining room and home theater. A dramatic mahogany and glass staircase leads to the balcony game/room; two bedrooms (with custom designed furniture), and two en suite bathrooms. Designed to provide maximum creature comfort and total ease of maintenance the home immediately earned the appreciation of the owners and their guests. Ms. Molho devised a custom Zebrawood furniture ensemble for the loft-like kitchen, dining room, and living room/home theater, including a handsome sideboard/buffet/bar. 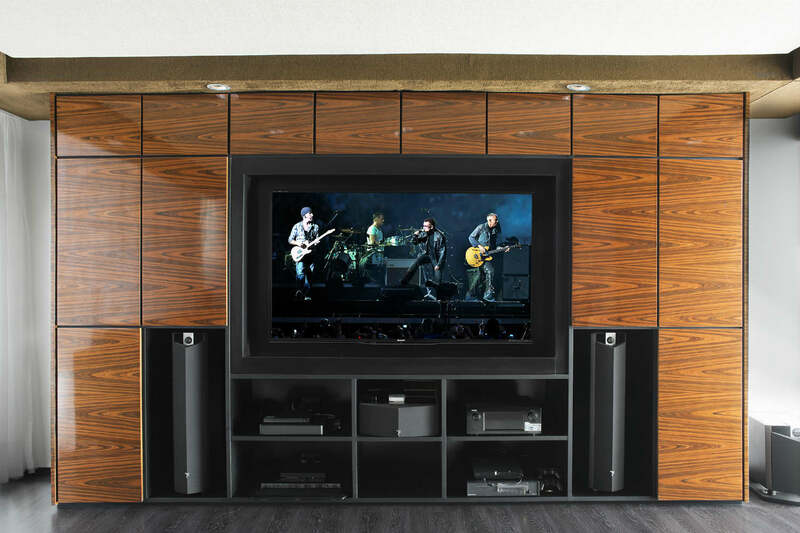 A pair of telescoping, mahogany doors, establish a dramatic two-way acoustic isolation barrier to inhibit sound leakage into (and out of) the home theater. 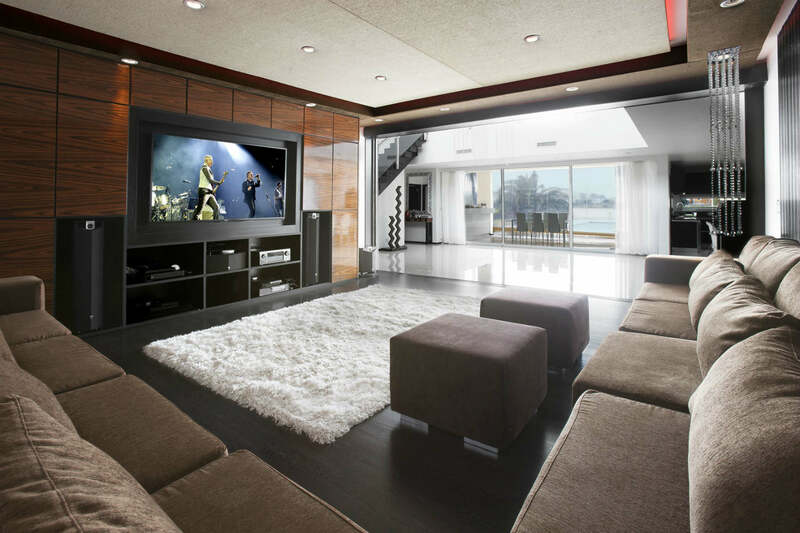 “We developed a series of six audio distribution zones throughout the home and pool area,” Sergio Molho reports. 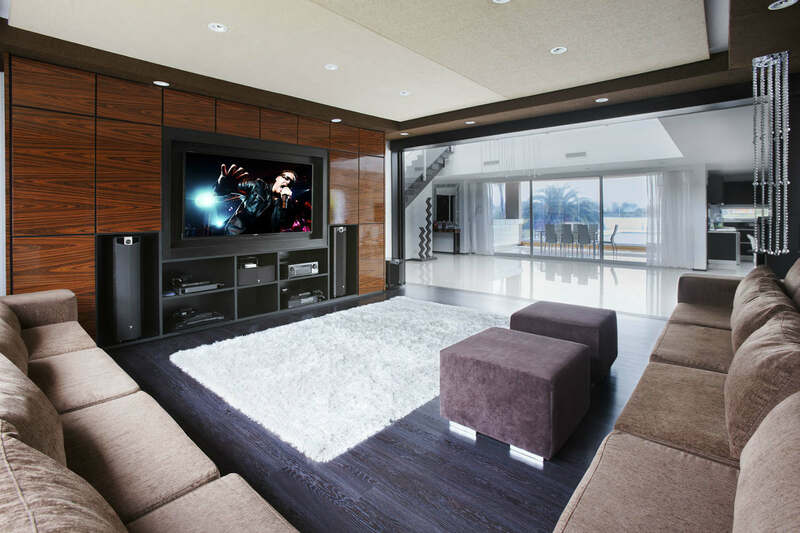 “In addition to the main Focal Chorus 716 speakers fitted into the home theater technology cabinet, ten “invisible” Stealth Acoustics Surround Sound speakers were imbedded into the ceilings of the kitchen, dining room and upstairs bedrooms. 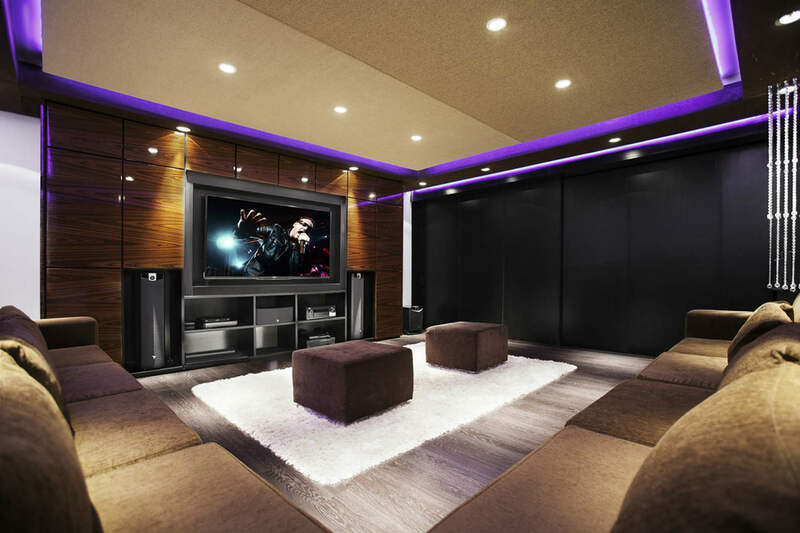 A sophisticated Crestron system was programmed to control the home theater’s audio video components, and to distribute music and control the lighting and HVAC throughout the entire home. A Panasonic projector mounted in the ceiling of the balcony game room, is positioned to project high res video (fed from the home theater) on the 105” motorized screen above the dining room table. Every creature comfort and contemporary technical advancement has been incorporated into this stunning ultra-modern home,” Molho says. Visit our Casa Fontela Project Page!